Enough coding!! Now is the time to create some custom segments for some deep analysis. In this section, we will set up a simple custom segment for all visitors who used the Spanish version of the site, visited the men's department, bought an item during their visit, looked at suits and visited the wedding registry section. 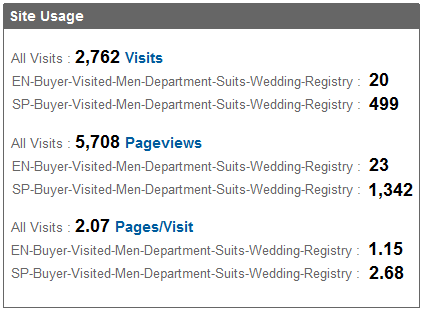 Segment 1: visitors who used the Spanish version of the site, visited the men's department, bought an item during their visit, looked at suits and visited the wedding registry section. Segment 2: visitors who used the English version of the site, visited the men's department, bought an item during their visit, looked at suits and visited the wedding registry section. 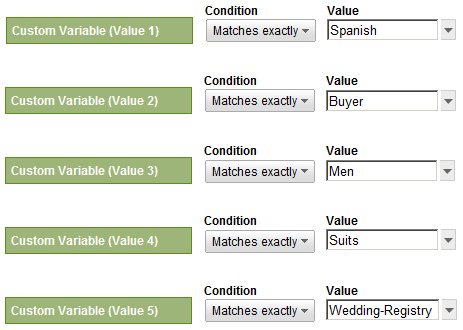 At first glimpse, the dashboard numbers confirm that the Spanish-speaking customers who visited the wedding registry and looked at suits is more likely to buy than the English-speaking customers who visited the same store sections! This is invaluable feedback to report back to your marketing team. We can easily create additional segments/reports (or use Secondary Dimensions & Pivoting, or extract the data via the GA API) and have a much deeper understanding of user behavior on the site, and act on these findings. What if you don't have an ecommerce site? No worries, the same concepts explained in the the above example are totally applicable to other types of sites. Lead generation sites, content sites and other types can definitely benefit from this powerful MCV feature. Just think of visitor segments & user actions that are important to you and then apply a similar implementation approach. Now go out, segment, analyze and truly understand your users! 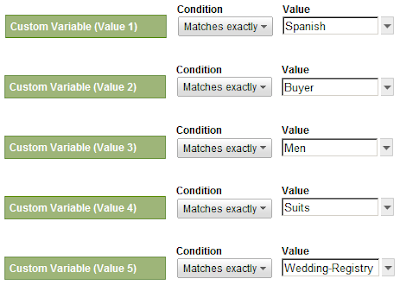 This is the second part of a two part deep dive guest post about using Multiple Custom Variables written by Allaedin Ezzedin from E-Nor, a Google Analytics Certified Partner in Northern California.